A blind tasted, medal-based competition, the Artisan Awards reviews and awards entrants based on product quality, price point, and authenticity. 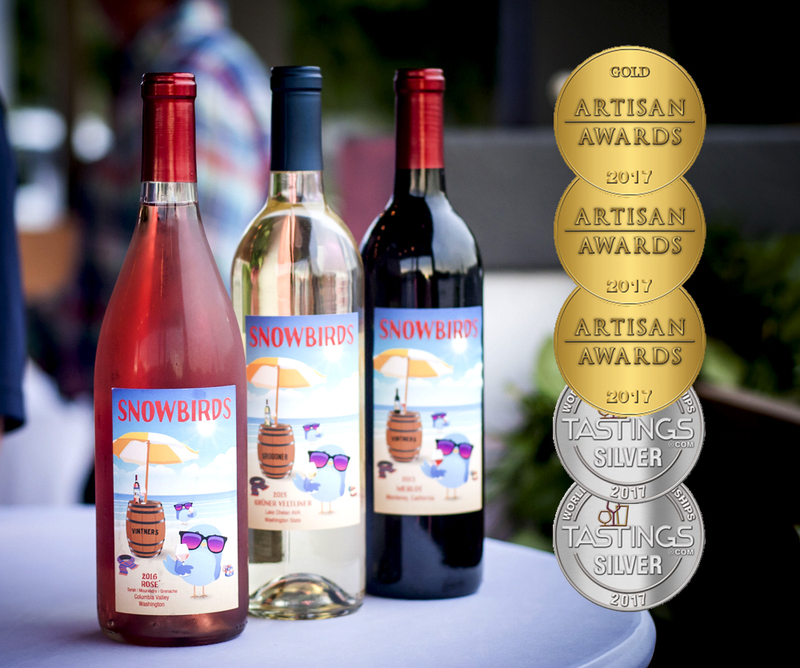 This year, Snowbirds Vintners wines were honored with top marks for their products, garnering gold medals for their entire portfolio. Snowbirds Vintners Rosé 2016 was handpicked and harvested to retain as much natural flavor in the grapes as possible. Whole clusters were macerated on the skins, and then hand pressed early the next morning in small batches, prior to cold fermentation in stainless steel. Shimmering salmon in color, with hints of lavender on the rim, bright aromas of wild strawberries and rose petal are present on the nose, as well as hints of white pepper and stone fruits. 100% American made, with five months in stainless steel to age, Snowbirds 2016 Rosé is crisp on the palate, with a medium body, and balanced acidity. Snowbirds Vintners Grüner Veltliner 2016 was handpicked and harvested at night, to retain as much residual sugar and flavor in the grapes as possible. Whole clusters were macerated on the skins, and then hand pressed early the next morning in small batches, prior to cold fermentation in stainless steel. The 2016 Grüner Veltliner exhibits a pale straw color, with reflections of platinum on the rim. Aromas of celery, lemon curd, star fruit and pineapple peel are present, as well as high minerality and crisp acidity on the palate. Snowbirds Vintners Merlot 2013 was handpicked and harvested at night, to retain as much residual sugar and flavor in the grapes as possible. After picking, the grapes were allowed to macerate overnight on their skins. The next morning, whole clusters were hand pressed in small batches before fermentation. Shimmering ruby-violet in color, juicy, savory aromas of spiced blueberry compote and black cherries are present on the nose, as well as coriander, cumin, and baking spice. Softly tannic and highly balanced, Snowbirds 2013 Merlot is fruit forward, while remaining crisp and dry on the finish. Flavors of dark berries, plum, and black cherries are present, as well as just a hint of spice box, earth, and vanilla. Recently, Snowbirds Vintners wines also won silver (Merlot, Rosé) from the Beverage Testing Institute, with their 2016 Grüner Veltliner receiving a 90 point rating on CraveLocal.com. Snowbirds Vintners also plans to release a Gewurztraminer in early 2018, continuing their quest to curate the best, most unique wines each year. More details and tasting notes on this small lot wine to follow. Snowbirds full portfolio of products are available at specialty food and wine shops in key U.S. markets, as well as for online purchase at their winery at quantumleapwinery.com. Find out more about their wines at snowbirdsvintners.com, and follow Snowbirds on Facebook, Instagram and Twitter. FK Interactive is the agency of record for Snowbirds Vintners, and consults with winemakers and proprietors on best business practices, growth strategies, consumer narratives, and develops initiatives to support sales programming and deplete inventory. They are located in Winter Park, Florida. Contact them at [email protected] for more information on their wine and spirits clients, or to learn more about their services.